Witness an underwater ballet with beautiful Manta Rays of our Kona Coast. Manta Rays have no real teeth, no stinger, and a harmless disposition, in spite of their 8 to 14 foot “wing” span. 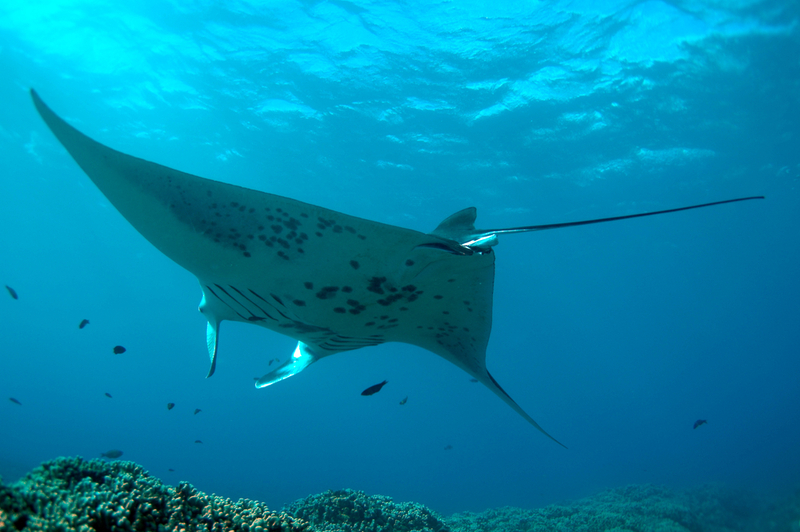 Most of the 400 Manta Ray on the Kona Coast are named and catalogued by frequent divers. The dive boat leaves just before sunset, and all snorkel or dive gear is provided. The actual night snorkel or dive lasts about 45 minutes, during which time manta rays feed on plankton attracted to the bright underwater lights provided each participant on board. Experience the thrill of a lifetime as these gentle creatures swim gracefully around you. Mantas are gentle giants with wingspans that can exceed 15-feet in width. Groups of Manta Rays converge nightly off of Keahole Bay to feed on the smorgasbord of phytoplankton that appear to soak up the glow given off by underwater dive lights. Sometimes referred to, as the “Butterflies of the Sea” these graceful sea creatures must be seen in person. It’s definitely a once in a lifetime experience and is often the “highlight of the trip” for many of our guests. The Uhane Nui O Nai’a boat is a 40’ USCG certified vessel, offering small group tours with a maximum of 25 passengers. Located in Kailua Kona; this tour departs from Honokohau Marina. 35 min drive from Waikoloa Beach/Mauna Lani Resorts. INCLUDED: Wetsuits, snorkel gear, flotation devices as needed, lights, swim guides in the ocean with you, water/soda/juice, dry snacks, warm shower, hot chocolate/coffee/tea, and 12-20 photos of your trip. *Why we love it: They provide an array of photos from your tour and warm water showers! Enjoy a scenic boat ride along the Kona coast aboard the Manta and arrive early enough to take in a magnificent sunset. The Manta boat is a custom built 40’ x 14.5’ Newton dive/snorkel boat. It features an oversized swim platform and custom aluminum ladder that allow hassle free entry. Snorkelers glide gracefully into the water and exit effortlessly via our “water level entry”. Their fabulous crew will be with you guiding you through the whole experience. Located in Kailua Kona; this tour departs from Honokohau Marina. 35 min drive from Waikoloa Beach/Mauna Lani Resorts. These harmless and docile creatures need to eat 10 percent of their body weight, and with a guide you will witness this amazing phenomenon. Watching these amazing creatures somersault in front of you multiple times, close enough to where you could kiss them, is a once in a lifetime experience. On the way back to Puako pier, you’ll enjoy the beautiful starlit sky. Here’s a fact you might not know, Mauna Kea on the Big Island is the best place on earth to study the stars and the universe.